Enjoy the beautiful sunset while dining at sea on the Majestic, a brand new 150 foot motor yacht that has replaced the Navatek vessel in the Atlantis Adventures fleet. The island-style buffet and dining room are on the first floor, with a cocktail lounge and entertainment on the second deck, and an open-air observation deck on the top floor. 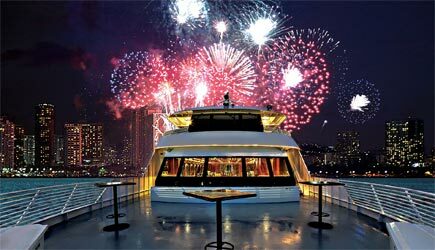 And extended cruise is offered on Friday evenings which includes fireworks viewing off the coast of Waikiki! Hawaii's largest dinner cruise vessel is 232 feet in length! 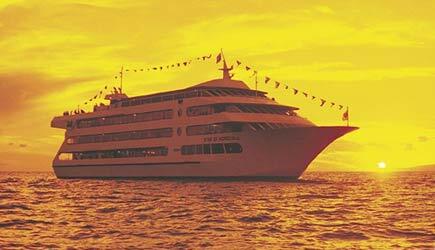 The Star of Honolulu is Hawaii’s largest and most popular dinner cruise vessel. At 232′ in length, she strikes an impressive “cruise ship profile” as she departs Honolulu Harbor. Her three types of stabilizers make her ideal for cruising in Hawaiian waters. She is Hawaii’s only A.D.A. compliant ship, with wide boarding ramps, 2 elevators, and 4 spacious decks. The Star of Honolulu offers the widest range of cruise selections and the best staffed entertainment on any dinner cruise vessel. From the scrumptuous seven-course French style dining on the upper deck, to the value-packed Pacific buffet … you’ll find just the right cruise option for you aboard the Star of Honolulu. Nothing beats a Hawaiian sunset at sea! Hawaii Nautical Sunset Cruises allows you to experience the Waikiki sights and the breathtaking Hawaiian sunset on the sea. On Fridays, there is a fabulous fireworks show! You have the option of departing from Kewelo Basin Harbor with transportation from Waikiki or the Hilton pier. We can’t imagine why anyone would want to get off a cruise ship and then get on a smaller boat to go on one of the Oahu dinner cruises, but if that’s what you’d like to do, the Navatek and Star of Honolulu dinner cruises depart from the same harbor where cruise ships arrive in downtown Honolulu and the timing does work. If you’d like to do the Hawaii Nautical Sunset Cruises, it is about a 10 minute cab ride to Kewalo Basin Harbor. If you are celebrating a special occasion or want to have a REALLY fine dining experience out on the water, I definitely recommend the Star of Honolulu Five Star Dining. This is an ultimate luxurious and romantic experience … and is an exception to the “you’ll get better food in a restaurant” opinion!